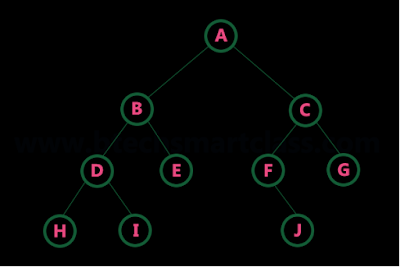 A binary tree is represented using array representation or linked list representation. When a binary tree is represented using linked list representation, if any node is not having a child we use NULL pointer in that position. In any binary tree linked list representation, there are more number of NULL pointer than actual pointers. Generally, in any binary tree linked list representation, if there are 2N number of reference fields, then N+1 number of reference fields are filled with NULL ( N+1 are NULL out of 2N ). This NULL pointer does not play any role except indicating there is no link (no child). 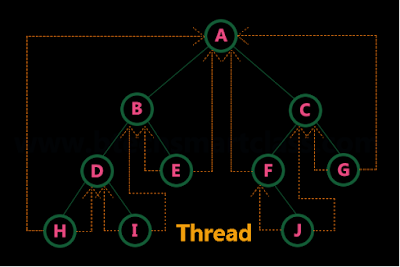 A. J. Perlis and C. Thornton have proposed new binary tree called "Threaded Binary Tree", which make use of NULL pointer to improve its traversal processes. In threaded binary tree, NULL pointers are replaced by references to other nodes in the tree, called threads. Threaded Binary Tree is also a binary tree in which all left child pointers that are NULL (in Linked list representation) points to its in-order predecessor, and all right child pointers that are NULL (in Linked list representation) points to its in-order successor. If there is no in-order predecessor or in-order successor, then it point to root node. When we represent above binary tree using linked list representation, nodes H, I, E, F, J and G left child pointers are NULL. This NULL is replaced by address of its in-order predecessor, respectively (I to D, E to B, F to A, J to F and G to C), but here the node H does not have its in-order predecessor, so it points to the root node A. And nodes H, I, E, J and G right child pointers are NULL. This NULL ponters are replaced by address of its in-order successor, respectively (H to D, I to B, E to A, and J to C), but here the node G does not have its in-order successor, so it points to the root node A. 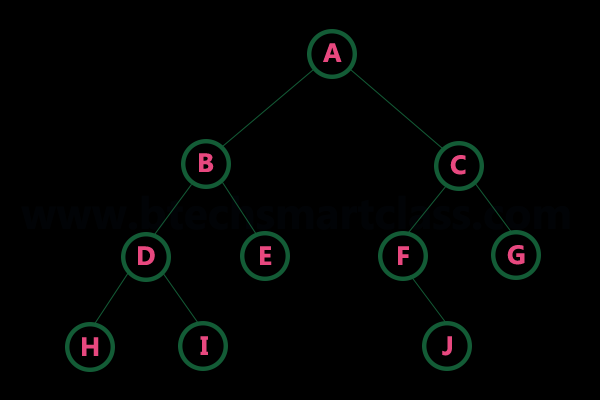 Above example binary tree become as follows after converting into threaded binary tree. In above figure threadeds are indicated with dotted links.